Pam's favorite class is called a Butterfly, and she has one that has been in her family for more than 40 years. A Butterfly is a small scow designed in the early 60's that is actually pretty neat. Its rounded bottom makes it very responsive and its over-rotating mast makes the mast bend to windward to give the sail a 3-D curve, so the rig is more powerful than a Laser/Torch. There are two things I do not like: 1) its name [and Pam sometimes makes me wear a t-shirt with a big Butterfly on the chest when I race against the Dallas Laser Fleet] and 2) the rudder is a metal plate that stalls out very easily. Scows are sailed mainly on lakes because they do not handle waves well. Their national championship this year was in Spring Lake, Michigan which was on my way home after the Canadian Laser Masers, plus I had won this before, plus it's always a fun event. So I dropped in, borrowed a brand new boat from Windward Boatworks and was able to defend my title. The third shows a series of bonehead mistakes that I made on the first leg and how I was able to come through the fleet once I got my act together. Update: at the end of this last video when describing how I caught the leader on the final leg, I ran out of time because of YouTube's 15 minute limit . Here's more detail: I tried to get him to choose between covering me tacking on the shifts/pressure and his preference of staying close to the favored right shore. At one point, I went way close to the shore, he covered, ran aground in the sand, and lost his speed trying to tack away. I think this is where he slowed down enough for me to catch him. Another example of the perils of covering! This is a really fun class that is a good training boat for Laser/Torch people who live near a lake. And the people it attracts enjoy good competition without the sometimes intimidating intensity of the Laser/Torch class. Oh please stop it. There is no such boat as a Laser/Torch. And I don't think you can buy a Torch yet either. So please call us Laser sailors what we are. We are Laser sailors. And we sail Lasers. And some of us are members of the Laser Class. 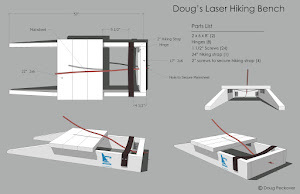 And you are on my list of Best Laser Sailing Blogs on the Planet. Congratulations on winning the Butterfly/Flashlight Single-Hand/Footed Championboat/ship. It's a Canadian thing ... showing his respect for Kirby ... and he did just get back from Canada ... and hello? improper course ... we like to take a few steps backwards and spin around in circles before deciding on a direction. Excellent videos, great viewing. I'm going to have to try to get more patient at the committee boat end of the startline! Thanks. I enjoy sharing what works and, more importantly, what does not. A great question! Yes, the mainsheet is hooked under the rail because it pulls the boom down in the same way as a vang. This means that the vang is not needed, so it can be used as another control. If you look at the bottom of the mast, there's a vang lever. I use this to control the position of the mast relative to the boom, and pushing the lever to leeward means the mast "over rotates." This is a trick I learned from Frank Bethwaite in the 70's that makes oval-shaped masts bent to windward! So, I use the vang of a Butterfly to control the position of the vang lever and the resulting windward bend in the mast. Pretty advanced stuff! This creates a 3-D shape in the sail which is very powerful. But you have to be careful because, unlike a Laser, the sail gets fuller in gust. Aha, like ice boats too. Thanks for the explanation. At 12:45 minutes into the third video, you say that you were in better pressure than the boats that were to windward of you. You tacked onto port to consolidate. I thought that was an interesting move. 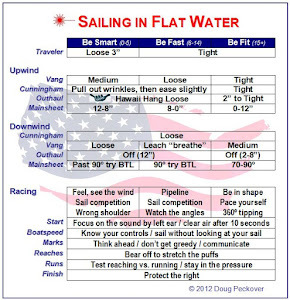 You weren't worried about sailing out of good pressure (into less pressure where the other boats were)? Hi MJ, they weren't to windward but were slightly behind going the opposite way on port. I was in more pressure on starboard and wanted to use this pressure to tack and put my gains "in the bank" while minimizing the gap between us. With no other boats around, this was an easy decision. On the first beat with lots of boats around, I would not have tacked. As a rough guideline, I sail the course on the first beat and the competition on the other beats. Great video Doug. I really like when you stop and explain the situaiton and options available and why you chose one. One thing to consider - when you do make a mistake (e.g. first beat in race 1, going hard left, sailing away from rest of fleet, and not knowing the local race area) - what was the root cause of this "mental error" and what would you do to address it the next time you're in a new locaiton. I've always thought that the brain of a sailor is like a bookshelf - if you push a book at one end, another will fall off at the other end. In other words, you can only remember and process a limited amount of information. Some people have wider bookshelves than others and can remember a lot. Mine is smaller than most, so I have to rely more on gut feelings. The root cause of my error was I was (1) on a lift (2) in good pressure while (3) sailing the course on the first leg (as noted, this is how I prefer to sail the first leg). 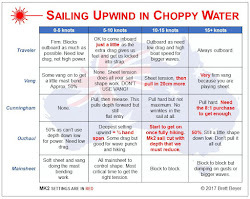 The lesson learned is that sailing a brand new boat on a lake I have never been on before with local sailors who know the lake better than me, I should have been more conservative and trusted their judgment rather than my own gut feelings. How Long Can Someone Survive Under Water?